The Battle of the Bulge – Book Review | Armchair General Magazine - We Put YOU in Command! It is not surprising, then, that in this 70th anniversary of Hitler’s desperate 1944 gamble in the Ardennes and the Allied (primarily American) defense that ground it to a halt, author and illustrator Wayne Vansant would create one of his graphic novel–style histories about the battle. Armchair General has given several of his previous publications (D-Day, the Battle of Gettysburg, Red Baron) two thumbs up, but The Battle of the Bulge may be his best yet. He ramps up the tension found in his previous books another notch or two in this one, and I found myself turning pages even when my eyes were saying, “Turn off that lamp and go to sleep.” There are 11 chapters and four appendices, the latter being Allied and Axis Divisions, U.S. Tanks, German Tanks, and Further Reading. I found nothing to really grouse about, but I suspect the book was edited more hurriedly than previous ones in the series were. There are a couple of minor typos, and I found myself wondering if two images were mismatched with their text information in the section on U.S. Tanks at the end of the book. The tank with the short-barreled 75mm gun is identified as an M4A3, while the one with the longer 76mm is called the M4A1. Both guns were used on different variants of those M4 models, but I would have expected the longer-barrel image to go with the M4A3. None of these issues have any significant impact on the book. The one thing I did find curious is that the German operation is referred to as Wacht am Rhein (Watch on the Rhine) throughout the book. That was the original name, which was changed to Autumn Mist, according to many sources I’ve read. Some say Watch on the Rhine was the codename for the buildup of German troops, while the offensive itself was called Autumn Mist, a name that doesn’t appear in Vansant’s book. As with all the books in this Zenith Press series, how much readers will enjoy it will depend on whether or not they can put aside the notion that this is a mere comic book because of the media Vansant employs. Those who can will find a well-researched narrative that is extremely engaging while still communicating the horrors and the sacrifices that were the Battle of the Bulge. It doesn’t insult adult intelligence, and its format will make it more appealing to teens and pre-teens with an interest in history. Be aware that the images are bloody, as they should be in a book of this type, but it is a great way to introduce younger readers to the story of the Battle of the Bulge, providing those readers are old enough to deal with the violence depicted. Highly recommended. Gerald D. Swick, senior editor for ArmchairGeneral.com, contributed several articles to The Encyclopedia of World War II: A Political, Social and Military History (ABC-CLIO, 2005). 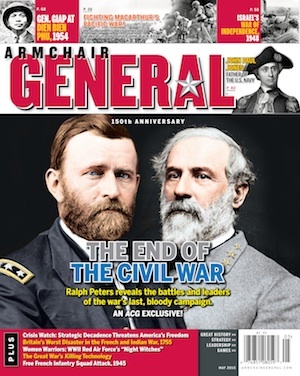 His article on the Romanian armies’ nightmare at the Battle of Stalingrad is scheduled to appear in the March 2015 issue of Armchair General magazine.